Outside the Australians in Film headquarters in Raleigh Studios, Screen Australia CEO Graeme Mason, Steven McGregor, FX showrunner Aida Mashaka-Croal, Bain Stewart, Leah Purcell, Danielle MacLean, Australians in Film staff Krista Carpenter, Greer Simkin, Warwick Thornton, Screen Australia’s Penny Smallacombe, Australians in Film executive director Peter Ritchie. 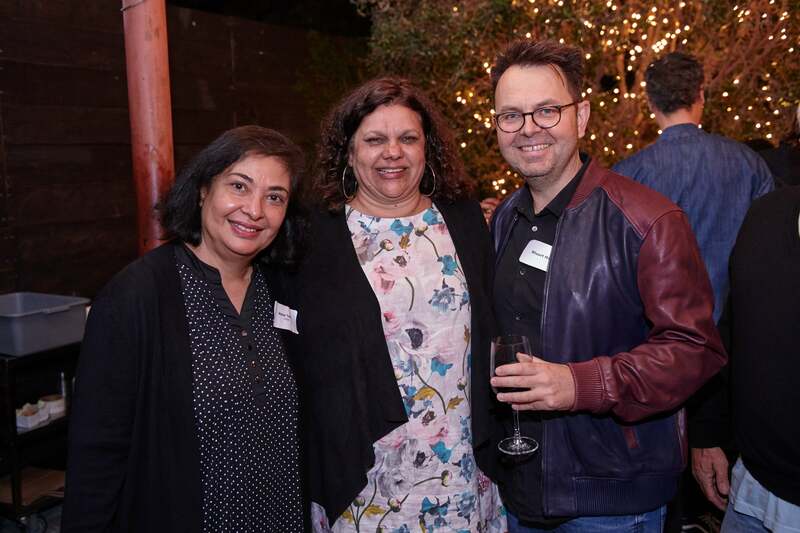 Through our annual grant program, the HFPA helped non-profit group ‘Australians in Film’ to support IndigenousLA, a program to bring Indigenous filmmakers to Hollywood for the first time, to expand their career. Warwick Thornton is one of Australia’s most acclaimed filmmakers. His 2010 debut film Samson and Delilah was shortlisted for the Academy Award for Best Foreign Language film and last year, he won the Venice Film Festival’s Caméra d'Or for his English-language film, Sweet Country. But the Indigenous filmmaker admits he still wasn’t expecting the warm welcome he received when he came to L.A. as part of the IndigenousLA program. 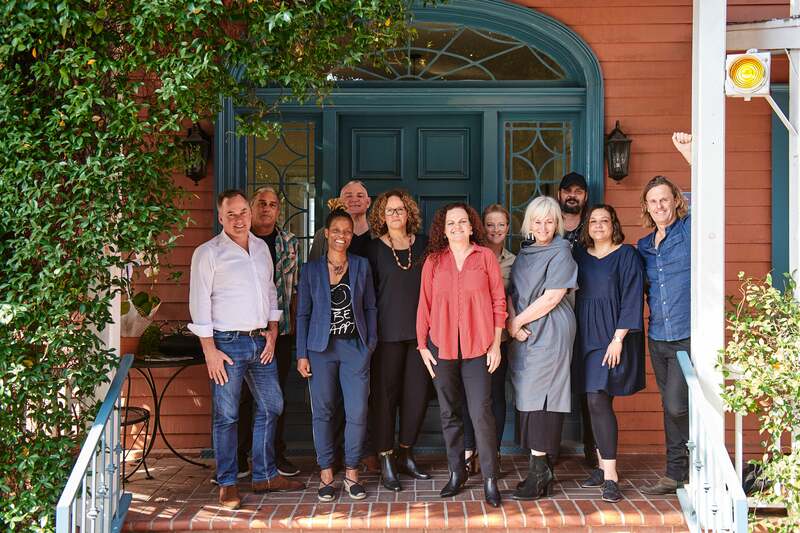 The program hosted five Indigenous filmmakers in L.A. for a series of networking opportunities and meetings with top Australian and American executives. Joining Thornton was: actor, writer and director Leah (Wentworth, Cleverman) Purcell; writer and director Steven (Sweet Country, Mystery Road TV series) McGregor; Erica (My Bed Your Bed) Glynn and Danielle (Queen of Hearts) MacLean. They were also joined on the trip by non-indigenous filmmaking partners Greer (Sweet Country, Mystery Road) Simkin, David (Mystery Road, Sweet Country) Jowsey and Charlotte (Queen of Hearts) Seymor as the Australian Federal Government screen agency Screen Australia co-hosted the trip on the 25th anniversary of their dedicated Indigenous department. Hollywood embraced the group in the spirit of encouraging diversity and global voices, welcoming them to their offices for advice and support. Participants included; Ryan Murphy, Ian Brennan (Ryan Murphy TV), David Levine (HBO), Keli Lee (ABC International), Emily Rudolf, Lauren Tuck (OWN, Harpo), Kate Lambert (FX), Dede Gardener and Caroline Carms (Plan B) and head of Amazon Studios, Jennifer Salke, who was joined by COO Albert Cheng and other top executives at a wine and cheese reception they hosted with the delegates at their Culver Studios home. At the welcome reception held at Spartina on Melrose earlier in the week, HFPA president Meher Tatna made a speech welcoming delegates and praising guests who came to lend support, including executives from Netflix, hulu, Apple Originals, FX and Amazon. Also attending were: director Taika (Thor: Ragnarok) Watiti, producer Bruna (Big Little Lies) Papandrea and executives from Lucky Chap (Margot Robbie’s company) and Blossom Films (Nicole Kidman’s company). Meher Tatna, delegate Erica Glynn and director Stewart McDonald. Australian director Phil Noyce hosted a BBQ for the group on another evening and others who participated in work dinners or sessions included: writers Stuart (Pirates of the Caribbean) Beattie and Luke (Lion, Beautiful Boy) Davies, Gentle Giant Media CEO Greg Basser, Macro CEO Charles King and FX showrunner Aida Mashaka-Croal.